Ever tried measuring your ingredients with a measuring cup? That could be so hectic sometimes, right? Worry less because now you can measure your ingredients and food with kitchen food scales. For those of you who like cooking and baking and worry a lot about overdoing the ingredients, this can be avoided by getting your kitchen food scale, and this would save you a lot of time spent in the grocery stores to make the long queues just for your ingredients to be measured accurately. The kitchen food scales also comes in handy when going on a diet and watching for the amount of calories intake by the body, that means fewer trips to the gym and no more long jogs. Food scales have evolved with time; long gone are the days when people used to use the analog food scales. Now the use of digital food scales is the way to go since they are more accurate and can measure even the smallest amount of food and calories. The important function of any scale is its efficiency, functionality, and capacity. The kitchen scale should be very accurate and consistent when measuring for easier use. 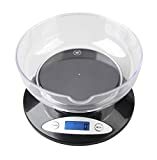 A good digital kitchen scale should be able to give accurate measurements, and the container of the food should not interfere with the weight of the food. Also, it should be easily adjusted to different measuring units. The best scale should have the ability to measure and weigh the ingredients using different measuring units. They should be able to weigh different weights whether it’s in grams, ounces, or kilograms and they should be easily adjusted with no hustle. 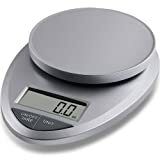 A good digital kitchen scale should be durable and serve you for a long time with minor or no repair at all. When looking for a good kitchen scale, you should consider the manufacturers help and support services. The digital scales come with a warranty and some can be between six months up to two years warranty. 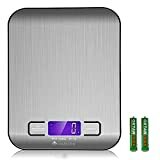 Etekcity digital kitchen scale is one of the best digital scales. It has a great and incredible accurate graduation which is as low as 1g and can go up to 7kgs. 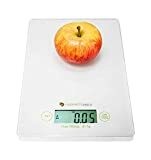 An added advantage is that this scale can easily convert to three other measuring units that is; pounds, ounces, and grams with just a push of the button. Also, the scale has an auto tare function which means one can measure the food with its container and the scale won’t take the container weight into account. The scale automatically shuts off after 120 seconds if it’s not in use thus saving on energy. Also, it has low battery convenient indication this making it easier to change your batteries on time. The scale comes with a one year warranty. · It includes adjustable calibration for maintenance and personal adjustment. · It has a low battery convenient indication. This no hustle kitchen scale by MIRA is a huge bonus for home chef or dieter its sleek designs makes it have a glamorous look in the kitchen, and it also takes less kitchen counter. The digital kitchen scale has LCD backlit for easy reading of the display measurements in any lighting. Also, the scale can be adjusted to read in grams, ounces or kilograms. An added feature is that it has tare function and the weight of the container is not considered. An advance in technology has brought change to the weighing scales. This scale is designed with superior technology and high precision sensors that can provide accurate readings. This weighing scale is made from a high-quality material that provides accurate readings and easy to maintain during the day to activities. This weighing scale has adjustable measuring units that can change to different metric systems. An additional feature is its sleek and professional design making it ideal for home use. It comes with a two-year warranty. · It’s compact enough hence uses less counter space. When looking for accuracy and precision, this scale is the way to go. The inspired Basics Digital Kitchen Scale has a precise tare function which is accurate and convenient for you. It also comes with rubber bottoms which are very stable and perform efficiently to minimize sliding off the counter. An added feature is its slim design which is only 9 inches making it light and easily portable. In addition, it takes less counter space and can even be stored in any other place as it takes less storage space. Also, it is very easy to clean without any contamination or damage to the scale. The scale also comes with a 1-year warranty. 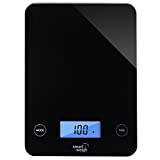 EatSmart Precision Elite Digital Kitchen Scale is among the best digital kitchen scales with it uniquely designed body and surface that is large enough to hold a mixing or baking bowl. 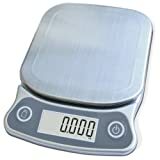 The scale weighs different weights ranging from 0.05oz or 1 gram to 15lb or 7kg thus making it appropriate for home use. It is equipped with a backlit light for easier reading of the measurement in any lighting. An added feature is that the scale comes with a calorie factors booklet. This scale is built with high-quality stainless steel for durability and easier maintenance. 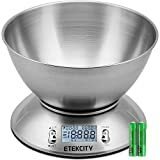 Etekcity Digital Kitchen Scale with Removable Bowl is another trusted product from the EteKcity company it has a high precision strain gauge that ensures accurate measurement results. It also includes temperature sensors and alarm timers to ensure that work is done efficiently and on time. The scale is made from a stainless steel material which is highly durable and very easy to clean. In addition, it has a vivid blue backlit display on the measurements which can be easily seen. An added feature is that it has a removable bowl which can be used for baking, stirring or washing your food and fruits. Precision and accuracy are the key features in any weighing scale. This scale provides accuracy in weighing your ingredients, and it has an adjustable key to change the measuring unit to different metric systems. The sleek design of this scale makes it have a glamorous look, and also it is lightweight making it easily portable. An added feature in this scale is that it has a removable glass bowl which is multipurpose and it increases on storage space and makes the kitchen counter less cultured. DecoBros kitchen food scale can indicate the volume of water, milk and most liquids. The weighing scale can weigh a minimum weight of 1 ounce to a maximum of 5kgs. Besides this weighing scale has a high precision strain gauge sensor which automatically indicates incase of the weight exceeding the limit. Also, the weighing scale can be easily adjusted to three other units; pounds, grams, and ounces. An added advantage is that it has tare function which means you do not have to calculate manually since the weight of the container is not included. · It’s capable of indicating the volume of water and milk. The Ozeri Pro Digital Scale is designed for the perfections who desires nothing but the best accuracy and functionality. The best part of the ozeri pro digital scale is that it incorporates buttons that generate sound when pushed this acts as a confirmation to the user. The scales platform is finished with an elegant chrome color; it has a capacity range from 0.05 ounces to 12lbs. Also, the scale displays results in both the international metric system and USA metric system. The EatSmart Precision scale weighs food directly, and it utilizes the scales tare function, which eliminates the weight of the container or bowl. The high-resolution surface and screens provide excellent viewing angles on any kitchen counter; it also has rubber feet which ensure that the scale does not slide off the table. The scale is highly accurate and can be easily adjustable to different metric systems. · It has rubber feet to minimize sliding off the counter. · It comes with an EatSmart Calorie Factor book. Now that you know the top ten best kitchen food scales what are you waiting for? Go out there and get the best model that suits all your needs and financial requirements. You can get a good kitchen scale without having to break a bank. The kitchen scales are durable, stable and function efficiently.